We bid adieu to our friends the Saguaro cactus as we have moved back to Southern California. This time not San Diego, but Los Angeles. We have had a hard time saying goodbye to the many friends we have made in our 5 years here in the desert, but are excited for the next chapter in our life being near our granddaughter and her brother when he is born early next year. Five years ago, my wife and I created a 5 year plan. We are very family oriented and didn’t want to be too far away from any of our three daughters and future grandchildren. At that time, since none of our girls were staying in San Diego, we wanted to give it 5 years to see where they would land. Knowing all three, we knew they would stay somewhere in the western part of the US. Denver had been mentioned, Seattle and Los Angeles, so moving to Phoenix wasn’t that far off the map. Fast forward to today, all three are married (terrific son-in-laws). We have one daughter and her husband in Los Angeles and the other two and their husbands in Seattle area. Our Los Angeles family has our first grandchild with one on the way. At some point in the not too distant future we expect to see some grandchildren in Seattle, so time will tell where we ultimately end up. 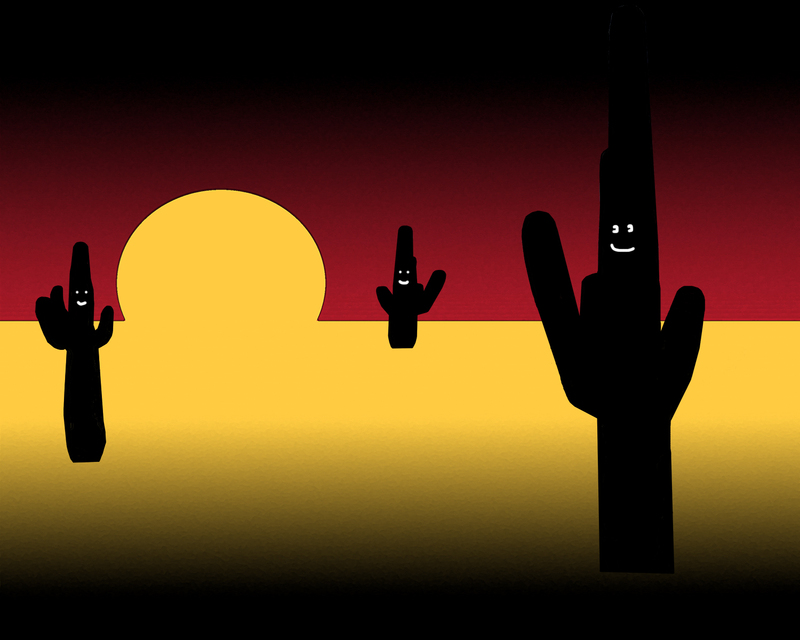 I used this picture I created of the Saguaro Cactus as the poor thing has been the brunt of family jokes with my wife. They spook her out…she says they look like large people in the desert and at night it just creeps her out. I find them very unique and of course symbolic of the “Old West”. Knowing we have all given her a hard time about the large people in the desert, just couldn’t resist adding some eyes and mouth as they say “goodbye” to us! This entry was posted in Abstract Watercolors, Landscapes: Watercolor and tagged arizona, artist kirt tisdale, desert, interior design, online art gallery, saguaro cactus on August 31, 2018 by Kirt D Tisdale. 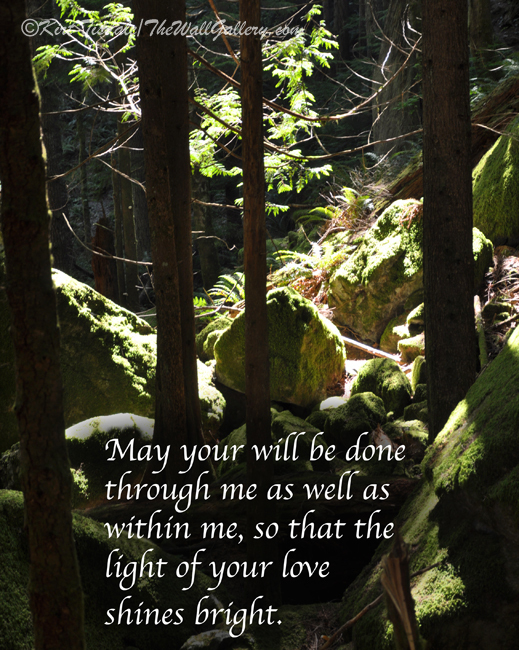 One of my personal prayers each morning and I thought this capture with the sunlit background made a great match…. 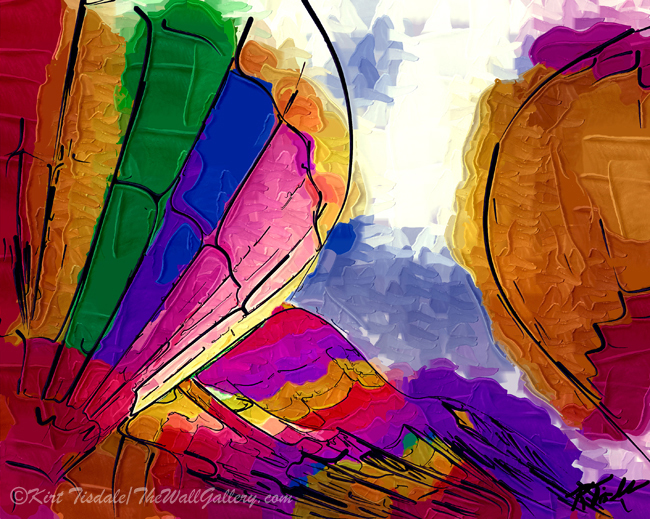 This entry was posted in Color Photography and tagged art prints, artist kirt tisdale, faith, inspirational, love, online art gallery, photographer, prayer on August 24, 2018 by Kirt D Tisdale. 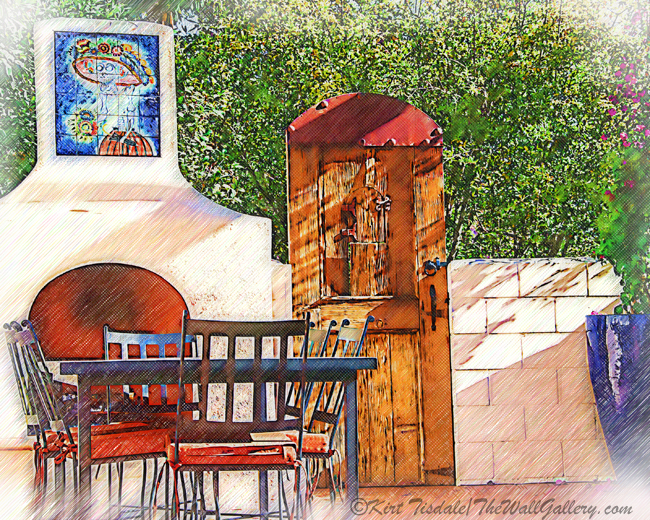 Using a sketching technique, I created these two prints of a patio done in a Spanish theme. 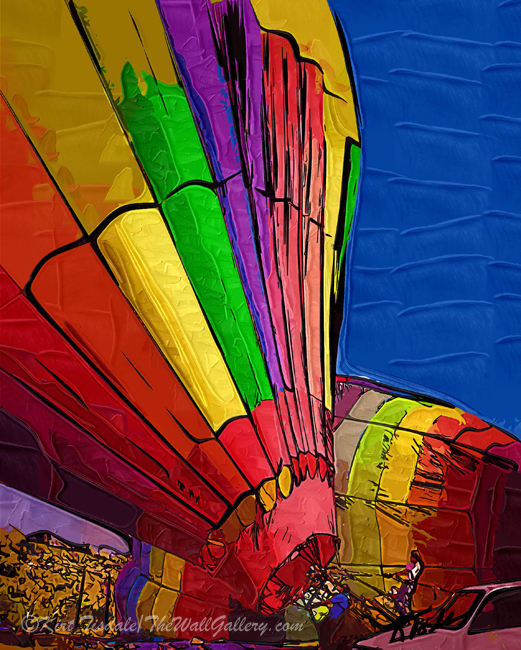 I like the softness the color sketching creates allowing the eye to see detail on specific subject and softening the edges keeps the eye more centrally focused on the specific subject matter. The setting is an outdoor patio/kitchen located in Los Angeles. The door is from a very old building and was repurposed for this project. The table is black metal and the top is inlaid with tile matching the color scheme of the tile work above the fireplace. What you can’t see is a grill and separate smoker lining the side on your right and a large screen TV on the wall to your left. The entire patio is covered by a pergola to create shade from the sun. Ok, so that’s the lay of the land if you will, so back to the prints. I have talked about framing a photograph or art print in such a way that you create focus on the visual aspects that you want to convey. I am presenting two very similar art prints, yet both create a slightly different sense because of what I have left in or taken away. In the first one “The Spanish Patio”, you have a bit more sense of the door, fireplace and table being a part of something bigger. This is created because the stone wall to the right of the door is shown with a hint of a large potted plant. Very subtle, but gives the impression of more there then just the door, fireplace and table. In this second print “The Fireplace, Table and Chair”, the focus is clearly just these three subjects. This presentation is my preference for that very reason. What I wanted to do was show two slightly different presentations of the same general subject matter so you can make your own assessment comparing the two. I believe they do tell slightly different stories for the reasons I have stated…..Thoughts? 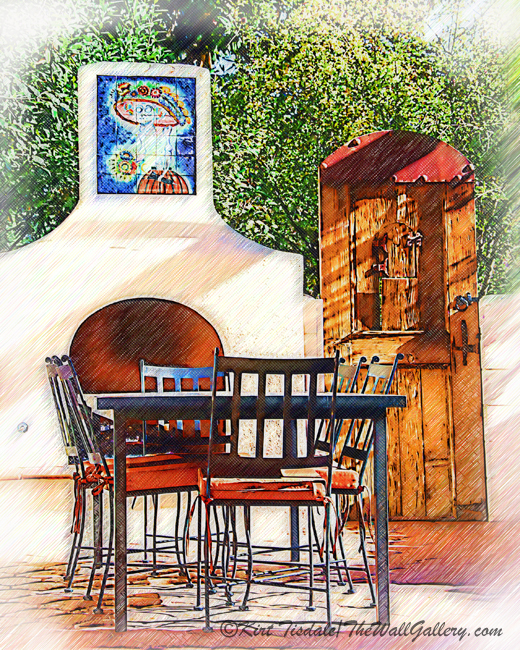 This entry was posted in Art Prints and tagged artist kirt tisdale, interior design, old doors, online art gallery, patio, patio fireplaces, patio tables, spanish decor, spanish patio on August 10, 2018 by Kirt D Tisdale. 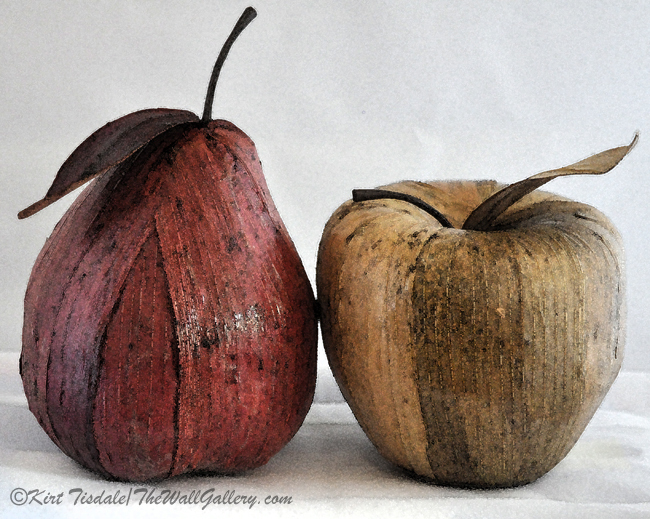 This week I am featuring three art prints from my Floral/Still Life Gallery. For these prints, I used a set of fake fruit that we had in a large bowl as a center piece (for still life objects just about anything around the house with a visual appeal works). 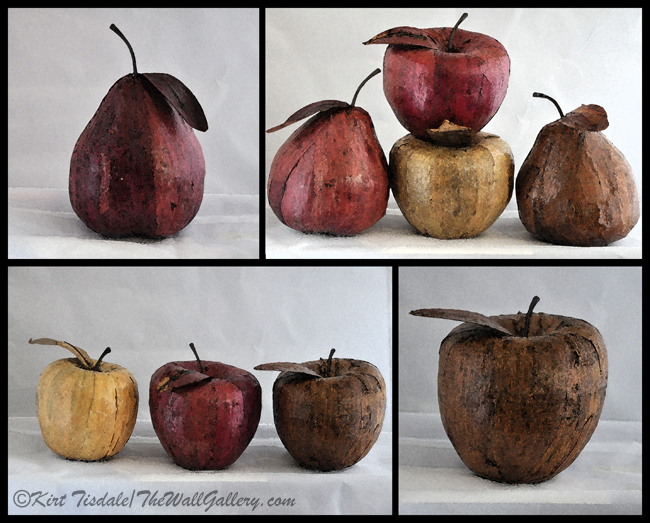 I have a small light box for such projects, so with a white background and base from the light box, I started arranging the fake fruit in various poses and alternated between the different colors and types of fruit (apples and pears to be specific and colors in gold, red and brown). Believe it or not the shoot lasted about an hour and a half…the fruit worked so hard and was so patient. From all of the configurations and colors used, I narrowed the shots I was going to use to about ten. I was really pleased with the captures I chose and then I began the next stage of the process. The results were crisp, sharp captures of this fake fruit. What I wanted to do was soften the pictures up just a bit to give the final product a more casual relaxed look while keeping the details of the original photography. 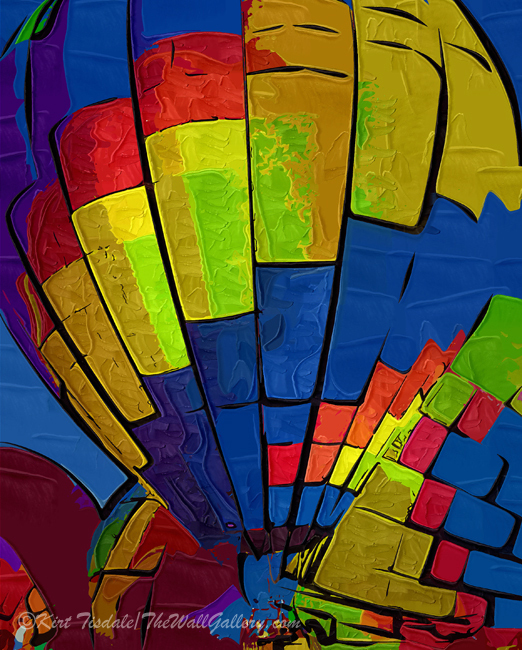 That’s where Photoshop comes into play and using the watercolor filter (you can control the levels and depth of the look), I chose just a light brushing to soften the edges and add texture to the white background. The first two art prints are representative of the ten that I did, but I also wanted to combine four of them into a collage, which is the final print featured. 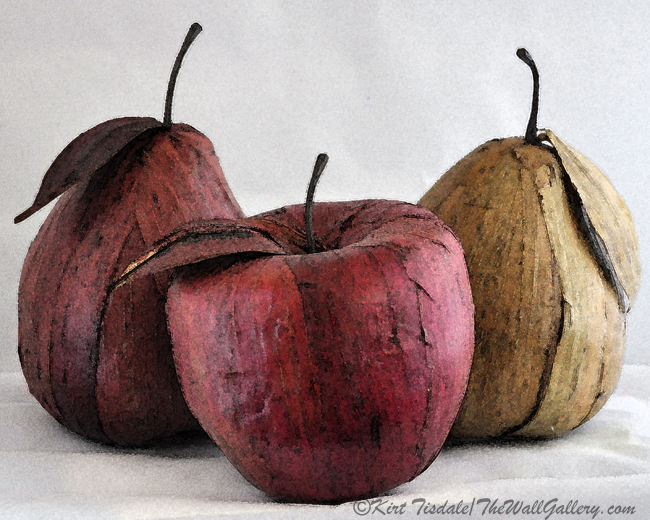 This entry was posted in Watercolor Painting and tagged apples, art prints, artist kirt tisdale, interior design, online art gallery, pears, photographer, photoshop, still life on August 3, 2018 by Kirt D Tisdale.